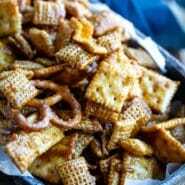 Best Chex mix recipe! 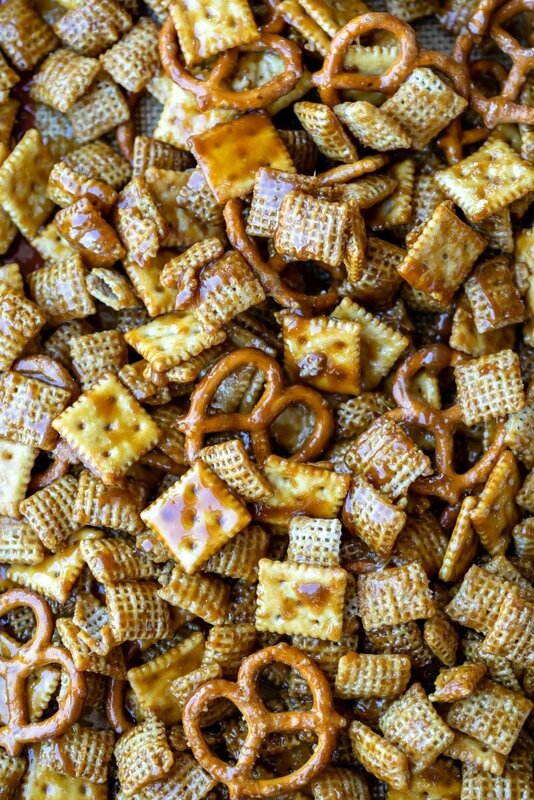 This toffee chex mix is a sweet and salty mix coated in rich brown sugar toffee for the ultimate snack or dessert! We love our snacks around here! This time of year it’s nice to watch a movie and enjoy some popcorn or Chex mix. 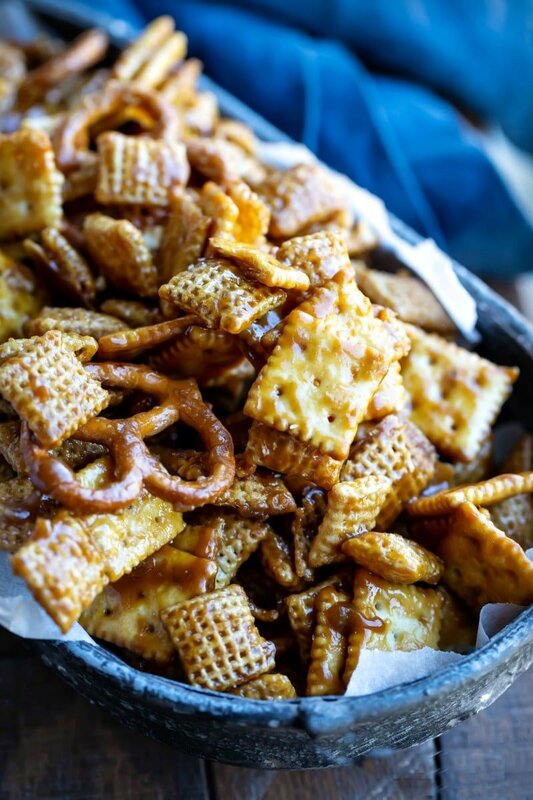 This Toffee Chex Mix is one that my entire family loves. The combination of the rich brown sugar toffee and sweet and salty cereal mix is crazy good! It’s also really simple to make. 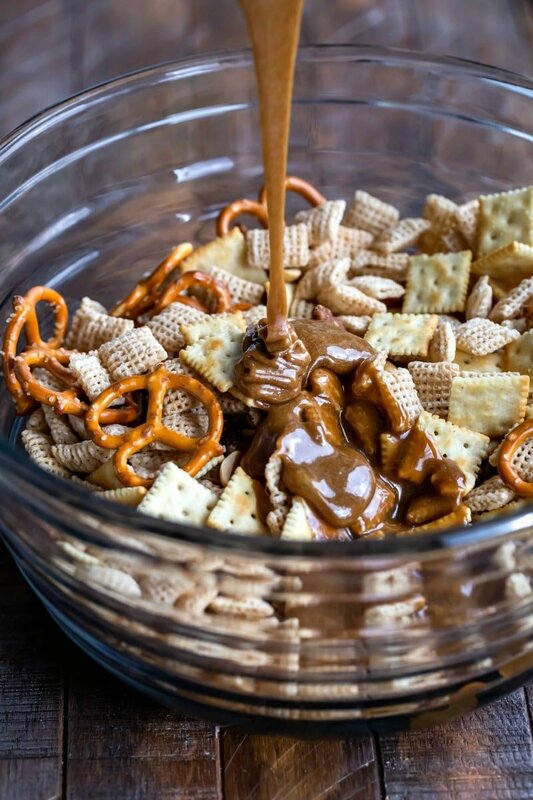 For this sweet Chex mix, you really only have to make the toffee coating. So, it’s easy to whip this up whenever the mood strikes! First, mix the cereal, crackers, pretzels, and nuts together. If you prefer not to use nuts, just sub in an equal amount of cereal, crackers, or pretzels instead. Then, make the toffee. First, melt the butter. Next, stir in brown sugar, corn syrup, and salt. Bring to a boil, cook 2 minutes, and then remove from heat. Carefully pour the hot toffee over the cereal, and toss to combine. Then, spread in an even layer on the baking sheet. You’ll bake, stir, bake, stir, bake, and then stir. I store leftover Chex mix in a resealable bag. It will stay fresh for about 2-3 days in a sealed container. 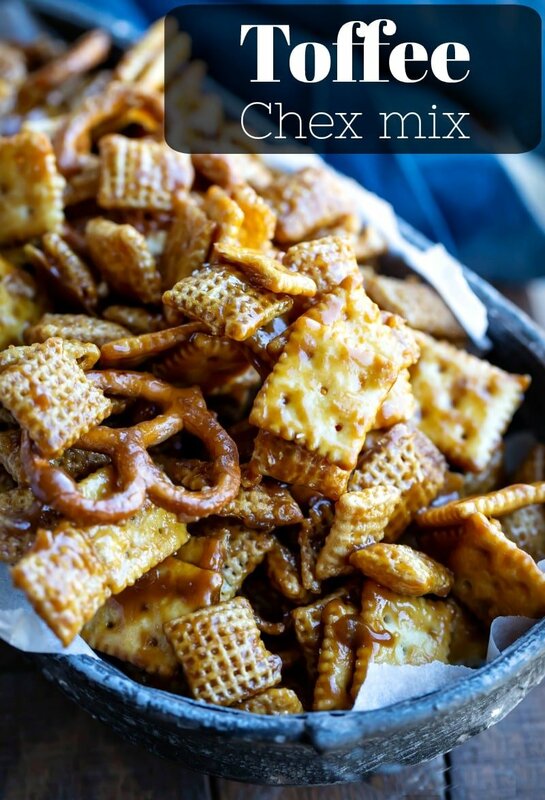 If you’ve tried this toffee Chex mix recipe, don’t forget to rate the recipe and leave me a comment below. I love to hear from people who’ve made my recipes! You can SUBSCRIBE to receive my latest recipe newsletters or FOLLOW ME on FACEBOOK, INSTAGRAM and PINTEREST for even more delicious food. In a large mixing bowl, combine cereal, nuts, Saltines, and pretzels. Set aside. Once the butter has melted, stir in the brown sugar, corn syrup, and salt. Bring the mixture to a boil, stirring frequently. Allow the mixture to boil for 2 minutes, and then remove from the heat. Whisk in vanilla extract, and then add the baking soda, mixing well. The toffee will foam. Continue whisking until well-combined. Pour the hot toffee over the cereal mixture, and carefully fold to coat the cereal mixture with the toffee mixture. The cereal mixture doesn't have to be perfectly coated. Spread the cereal mixture in an even layer on the prepared baking sheet. Carefully stir the cereal to coat with melted toffee. Continue baking for 15 minutes, stir, and then bake for another 10-15 minutes. Remove from oven, and then toss one more time. Spread into an even layer, and let cool. *You can swap in an extra cup of cereal, crackers, or pretzels in place of the nuts. **I use a half sheet pan. If you don't have a baking sheet that's that large, use two smaller baking sheets. ***You'll need a pan that will give you enough space for the toffee to foam up when you add the baking soda. This is amazing!! It’s saltine toffee chex, and I love it! !